Chris and I went out of town to visit some friends the other weekend. Between the three couples, we had to celebrate three birthdays, an engagement, a new house and a pregnancy. It was only right that I brought a cake! This cake might take some time and effort, but the end result is worth the wait. I love the rustic look of the cake (you say messy, I say rustic) because it's fun and playful. 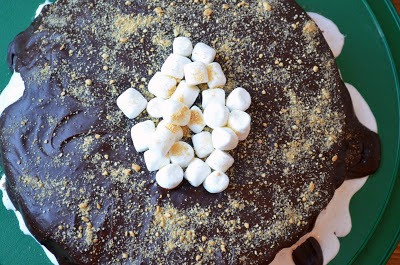 You can definitely taste the graham cracker crumbs in the cake portion, so the marshmallow fluff and chocolate topping make it a perfect s'mores combination. It definitely brings you back to childhood. Enjoy! To make the cake, preheat the oven to 375° F. Line the bottom of two 9-inch round cake pans with parchment or wax paper. Grease and flour the sides of the pans; set aside. In a medium bowl, combine the graham cracker crumbs, baking powder and salt; stir together and set aside. In the bowl of an electric mixer fitted with the whisk attachment, beat the egg whites on medium-high speed until soft peaks form. Transfer to a separate bowl and set aside. Replace the mixer bowl and fit with the paddle attachment. Cream together the butter and sugar and beat on medium speed until light and fluffy, about 2 minutes. Mix in the egg yolks until well combined. Stir in the vanilla extract. Add in the dry ingredients alternately with the milk on low speed, beginning and ending with the dry ingredients and mixing just until incorporated. Using a rubber spatula, fold in about a third of the egg whites to lighten the batter. Gently fold in the remaining egg whites until completely incorporated. Divide the batter evenly between the prepared pans. Bake the cakes for about 20 minutes or until a toothpick inserted in the center comes out clean. Allow the cakes to cool in the pans for about 5-10 minutes, then invert onto a wire rack, remove the parchment paper and let cool completely. Once the cake has cooled completely, transfer one of the cake layers to a cardboard cake circle and place on a serving platter. Carefully spread a layer of marshmallow fluff over the cake, not quite reaching the edges. Top with the remaining cake layer and refrigerate for about 1 hour. To make the milk chocolate glaze, combine the chocolate, cream, butter and corn syrup in a heatproof bowl set over simmering water. Heat until the chocolate has melted, then whisk the ingredients together until completely smooth. Pour glaze over the top of the chilled cake, allowing it to run down the sides in some places. Garnish with extra graham cracker crumbs, and mini marshmallows. Return to the refrigerator to chill until set. Allow to sit at room temperature about 20 minutes before serving.